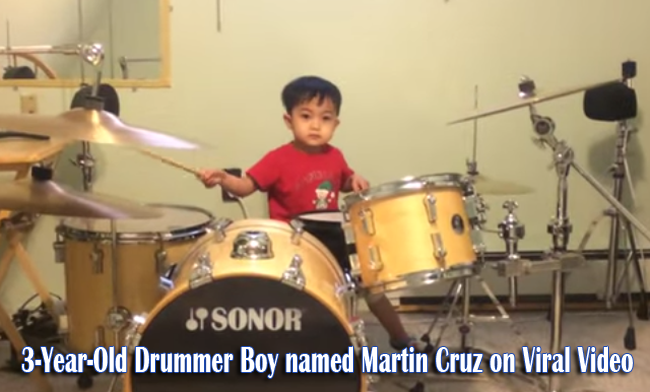 Three year old drummer boy, Martin Cruz, wowed the netizens in a viral video showing him playing with the almost perfect precision of a soon to be professional. In the said video, he does not even looked like having a hard time. This Filipino boy, living with his family in Iselin, New Jersey, made his father, Dennis Cruz, proud. His father wanted him to be a great drummer like Phil Collins. Mr. Cruz is a Church drummer himself. He was rehearsing when he first noticed his son trying to copy him. He had seen the child’s ability to mimic his beats. He let the kid sit on his stool and try out the drum set. According to his father, Martin was able to play just by the ear. He had no music lessons, but he was able to play just by listening to a song. Since 2 and a half years old, he had been playing in churches in New Jersey. His talent is considered as a gift to be honed. His family is planning to enroll him in a professional drum school as soon as he can. He is a real natural drummer. His video won the awe of the netizens and it quickly went viral. On his face, one can easily see that he is just simply enjoying himself. He had no pressure. He truly has a gift to be thankful for. Like Fr. Panganiban, their chapel priest had said, all the gifts are from God and we should be thankful for it.